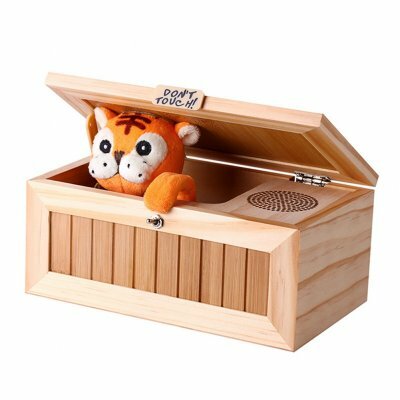 Successfully Added Wooden Useless Box Leave Me Alone Box Most Useless Machine Don't Touch Tiger Toy Gift with Sound to your Shopping Cart. Useless box is also called useless machine, When you touch the button, a cute arm comes out and turns itself off. Give you great fun! Each time you touch the button,a small tiger reached his hand and turn off box. And which has 20 kinds of different action modes. Very funny! Although it has a name of useless, it will definitely bring you a lot of fun. Especially when you're in a bad mood. It can give you a good mood! Perfect for Desk Toys or a Cool Gadgets Gift It's also a perfect gift for birthday as well as Christmas Day.